Micro Focus views AWS as the enterprise cloud platform. Together we help our customers accelerate their digital transformation by helping them migrate to and benefit from the power of the cloud. 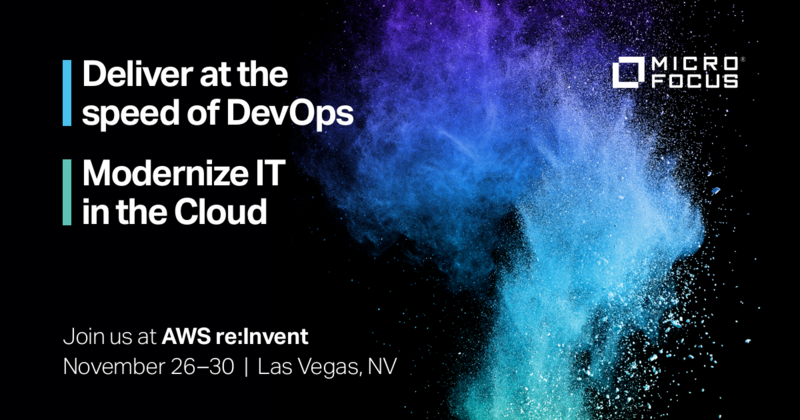 Join us at the AWS re:Invent Expo, Booth #1905 and at our Roundtable Sessions: •	Wednesday, November 28, 1:15-2:30pm (Encore Hotel, Chopin 4) Moving Mainframe Applications to AWS– Deep Dive Discovery Session and Expert Panel, Hosted by Micro Focus, AWS & Astadia. •	Wednesday, November 28, 3:00-4:30pm (Encore Hotel, Chopin 4) Application Migration and Management in AWS – ITOM Roundtable, Hosted by Micro Focus. Register your interest below for these sessions and check out our blogs.